ANTS is a premier IEEE forum on networking and telecommunications topics. It is the only conference in India, which is financially sponsored by IEEE Communications Society. The distinguishing characteristic of IEEE ANTS 2017 is the promotion of an intense dialogue between academia and industry to bridge the gap between academic research, industry initiatives and governmental policies. This is fostered through panel discussions, keynotes, invited talks and industry exhibits where academia is exposed to state-of-practice and results from trials and interoperability experiments. The industry, in turn, benefits from exposure to leading-edge research in networking as well as the opportunity to communicate with academic researchers regarding practical problems that require further research. This year the theme is “Communications for Smart City”. In addition to the myriad of the topics, special focus will be on accepting papers, which have special focus on enabling technologies for communications in Smart Cities. As Bhubaneswar is gearing up to build smart city, the theme of the conference will foster an environment for deliberating on different research aspects on the said topic. Extended version of some accepted papers in the conference will be considered for re-review and inclusion in the following special issues. We are also in touch with few other high quality journals for consideration of extended version of few other papers. 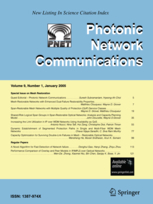 This journal publishes papers involving optical communication networks. Coverage includes network and system technologies; network and system architectures; network access and control; network design, planning, and operation; interworking; and application design for an optical infrastructure. IJCNDS aims to improve the state-of-the-art of worldwide research in communication networks and distributed systems and to address the various methodologies, tools, techniques, algorithms and results. It is not limited to networking issues in telecommunications; network problems in other application domains such as biological networks, social networks, and chemical networks will also be considered. This feature helps in promoting interdisciplinary research in these areas. SCOPUS, Compendex [formerly Ei], ACM, DBLP & Google Scholar.